When last we left D.J. Casser Enterprises (414 747 8733) and his mysterious, but amazingly effective, Black Diamond Racing Pyramid Cones, Francis 's wife, Gordana, was still in slackjawed disbelief that this innocuous looking tweak could produce such a vast improvement in audio quality. It was a wonderful moment for Tweako husbands! Who knew that Milwaukee, Wisconsin could produce such miracles? We thought they just made stuff that went into barrels. Now enter Casser's "The Shelf." According to the product literature, The Shelf has 25 times the resonance of granite. The carbon fiber materials used in The Shelf give it five times the tensile strength of steel. As an acoustic isolation device, it is meant to go under turntables CD players, amplifiers, etc. The Shelf exactly matches the dimensions of a Standesign MDF equipment rack board, with other sizes also available. This carbon fiber-based unit is a lovely thing to behold. The glossy, gray-black carbon fiber ripples and stretches through The Shelf like moving skin. It gives the impression of quiescent, animal electricity, waiting to be unleashed. And unleash The Shelf does -- The sound of your system. But we are getting ahead of ourselves. In the last issue of 21st, we discussed another carbon fiber wonder, the Wilson Benesch turntable, tonearm, and cartridge. In terms of audiophile happy surprise factor, this analog front end ranks right up there with winning the Lotto. Since the Wilson Benesch has entered their home, nary a CD is played anymore. Gordana and Francis have rediscovered the joys of an all vinyl lifestyle. CDs have become for them a cruel marketing joke, perpetrated by consumer electronics vendors who care not for sound, but for quickly obsolescent profit. When Brian Tucker of Pro Audio (847-526-1646) first came to Boston to setup the Wilson Benesch rig, one of the first things we did was slip under it The Shelf. Spinning around at the time was Messr. Armstrong, singing, as only Louis can, 'Let's do it, Let's Fall in Love' (Mobile Fidelity, Anadisc 200, "Ella and Louis Again"). The audible difference was immediately apparent. But rather than simply go by memory for this review, Gordana and Francis again repeated this simple turntable modification. First, we played the same Louis track, with The Shelf happily ensconced under the Wilson Benesch. We had also placed three Black Diamond Racing Pyramid Cones between The Shelf and the turntable. Louis' sometimes raspy voice was crystal clear as it floated in 3D between our Apogee Caliper Signature speakers. You could easily discern when Louis' voice caught in his throat, or when he smacked his over-ripe lips. Louis' lips were indeed trumpet lips. Francis now leaned over and grasped the turntable, while Gordana slipped in underneath him, pulling out The Shelf and Cones. For the review, this over/under maneuver was repeated a number of times, accompanied by the usual 'Got it? Can't see it! Hurry, my grip is slipping! Don't put it down yet!' routine that only husbands and wives can do so well. The Wilson Benesch system now sat naked and alone on top of the sterile Standesign MDF. The same Armstrong cut was then played again. Gone! All the detail was gone! Louis was surely singing, but all of the subtle details; the catching of his breath, the trumpeted-lip smacking, the vocal nuance, that which makes all things Velveteen real; had vanished. This LP was still very good mind you, but it was no longer You Are There. Instead, our dear 3D Louis had been unceremoniously slivered into a 2D cut-out Louis. Our minds had to work harder to fill in the performance blanks. If someone was to listen to the Wilson Benesch system without The Shelf, he or she may not have minded, nor even noticed, this sonic absence, so good is this analog system. But because Gordana and Francis knew the sinful difference, they had been summarily cast out from the Garden of Audiophile Eden. Having sinned once, it was, of course, easier for them to do it again. So they repeated the Shelf test, this time using the incredible, don't wait, buy it now, "Fantasy Film World of Bernard Herrmann" (Mobile Fidelity). Gordana had reviewed the MoFi CD version of this recording in the last issue of 21st, so she knew the album very well. On the Wilson Benesch, this Herrmann work was not just subtly different, it was a whole new recording! On the CD, the manifold and often mysterious instruments used by Herrmann were sometimes hard to recognize. But on the LP, they sprang into life, full-blown and real. For example, harps were now obviously harps, and not seeming synthesizers lost in a complex mix. This 'oh, my gosh' recognition happened repeatedly throughout the LP version of these sci-fi film scores. Gordana suddenly wanted to rewrite her Herrmann review. After the usual, 'This one. No that one. No this one' ritual, they picked one particular Herrmann cut for their carbon fiber taste test. This track, "The Duel with The Skeleton," was from the movie, 'The Seventh Voyage of Sinbad'. Left channel/right channel dueling Xylophones mostly dominate this piece. Always, when Francis listened to this track before, the percussive effects of the Xylophones rang his ears, even when played not that loud. Once more, Francis leaned into the analog breach, and Gordana whisked The Shelf and Cones away. Onto the turntable went the aggressively agitated skeleton. Sure enough, Francis 's ears didn't ring. The warring soundstage had receded. Rather than portraying a fight to the death match, this sonic duel seemed no more threatening than playground name-calling. With The Shelf in place, this apparent volume gain was noticed time and again, on many different recordings. Whether this effect is due to an increase in sonic resolution, better spatial imaging, your brain working less to create the stereo illusion, or Milwaukee-style VooDoom, Gordana and Francis just don't know. But this apparent gain effect with The Shelf was consistent. Gordana now carefully put back the three Cones on top of The Shelf, and under the turntable (two to the rear, one front and center). Again, a noticeable improvement was heard. Our warring Sinbad now had more grit in his teeth, the frenzied battle action was more panoramic. It looked like our boy Sinbad was going to win over his bony adversary after all. Without question, the Cones had upped the overall system resolution, over and above from using The Shelf alone. No mean feat, this. Rounding out The Shelf does it?/doesn't it? review comparo, we put on another MoFi LP. This recording was "Very Tall", with the Oscar Peterson trio and Milton Jackson on vibes. 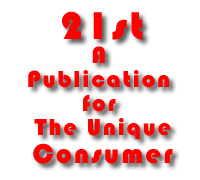 As in the last issue of 21st, "The Work Song" by Nat Adderly was used for review purposes. This cut has a lovely wham! wham! opening unison of vibes, piano and drums. Without The Shelf, it was hard to hear Oscar's piano in the midst of all the instrumental body slams. The Shelf was now put back in. Sure enough, Oscar's ivory digits magically reappeared. And more than that, the bass player decided to come right on through, elbowing aside Milt and Oscar. This increased bass resolution is another common characteristic of using the Shelf. And the bass dives deeper. When we play LPs instead of CDs, our Hsu subwoofer most always has to have its level control turned down a couple of notches. Always, always, always, The Shelf increased the overall resolving power of our system. With the Wilson Benesch/Shelf combination, it's rather like having all the joys of vinyl, with the clarity of CDs -- but without any of the concomitant digital nasties. Whether all these miraculous gains are due to an increase in acoustic isolation, or something else -- something at the edge of mystical -- your now thoroughly carbonized reviewers just cannot say. But what Gordana and Francis can categorically state is that if you own a turntable, using The Shelf is not a luxury -- It is a fact of life necessity. At $450, Casser's Black Milwaukee Wonder easily ranks right up there as one of the all time Great Audio Buys. So roll back the barrels! Milwaukee may need a PR image makeover if this stream of audio miracles keeps up.